These chocolate praline squares from A Southern Lady Cooks have the perfect blend of chocolate, nuts, and coconut. Preheat oven to 350º. Grease a 9-inch x 13-inch baking dish. Melt butter; add buttermilk, brown sugar, and eggs. In separate bowl, mix flour, cocoa, and baking soda. Add to buttermilk mixture, and stir to combine; add vanilla. Pour into prepared baking dish. Bake for 30 minutes. 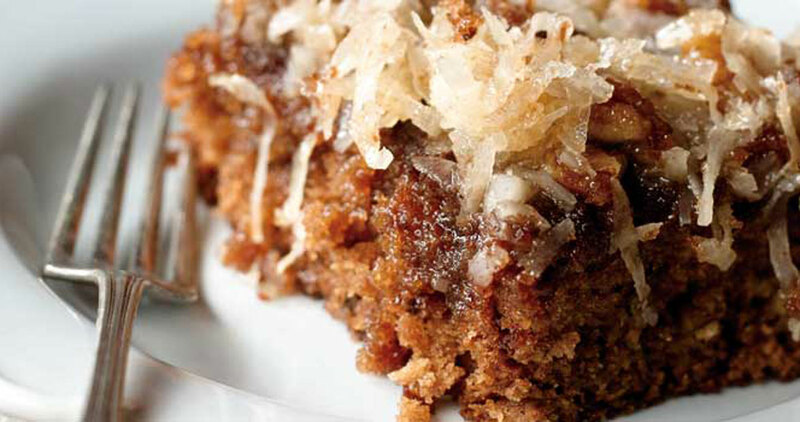 In small saucepan, combine milk, butter, brown sugar, pecans, and coconut for the icing. Place saucepan over medium heat, and cook until almost boiling, stirring frequently. Immediately pour over cooked cake, and return to oven. Continue baking until top is bubbly, watching to prevent scorching. Cool slightly; cut into squares.